Francis Veyette began his dance training at the age of ten at Dance Arts in Visalia. With his brothers Andrew and Michael, he began studying at Westside Ballet in 1992. He danced lead roles in The Nutcracker (Sugarplum Cavalier, 1995-96 and 1998) and The Sleeping Beauty (Prince Florimund, The Bluebird, 1997). His summer programs included the School of American Ballet in New York City and The Rock School of Pennsylvania Ballet. Francis became an apprentice with Pennsylvania Ballet in 1997, and was promoted to the Corps de Ballet in September 1999. Featured roles include Candy Cane and Tea in The Nutcracker, Petruchio in The Taming of the Shrew and Titania’s Cavalier in A Midsummer Night’s Dream. In August 2003 Francis joined Kansas City Ballet under the artistic direction of William Whitener. His roles for Kansas City Ballet include Cavalier and Drosselmeyer in The Nutcracker and principal couple in Paquita. Francis returned to Pennsylvania Ballet in Fall 2005. 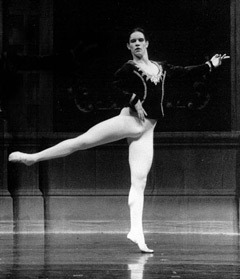 He was promoted to soloist for the 2007-08 season and to principal for the 2011-12 season. His principal roles have included the Pas de Deux in Balanchine’s Agon and Colas in Ashton’s La Fille Mal Gardee. See Francis Veyette’s bio on the Pennsylvania Ballet site.